Thanks to TYWKIWDBI for finding an item of Innuit cuisine from Greenland that is even more daunting than the Norse Lutefisk! Kiviaq, which I believe is named for the sound one makes if one is downwind when dinner is served, is made from thirty-or-so auks sewn-up in a seal skin. The pod-o-auks is sealed air-tight and buried under a large rock. It is left there to properly age for from three to eighteen months. 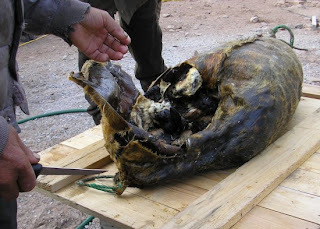 Then the sealskin pod is opened and the contents eaten raw.
" They always eat it outside as the smell is so overpowering that it would linger inside the house for weeks. The seal fat helps to both preserve and tenderise the bird meat so it can be eaten raw and whole, bones and all. It was quite a sight to see the family holding bird’s legs in their teeth and stripping off the feathers before chowing down on large parts of the bird." There are some dishes that I always wonder how people learned how to prepare. This, has earned a place at the top of my list. The Auk in happier days.